20 beautiful proposals in the most offbeat places around the world! Drop of tears, ‘Oh my God!’, ‘I can’t believe it’ and ‘Yes, I will!’ Do these phrases seem to ring a bell or is there a need for me to be more specific? Ofcourse, I’m talking about PROPOSALS!! Yes, the breathtaking, jaw-dropping moment that every girl dreams to have in the most perfect way possible. P.S.- this will risen up your hopes pretty high! 2. The beauty of forest with a personalised touch-Picture perfect! A mere look at this beautiful proposal, makes you want to wonder on the beauty of love! 3. The perfect half submerged in a lake proposal! This oh-so-perfect couple had a proposal just as beautiful as them. Pretty flowers, a serene lake and the beauty of nature all around! Mesmerizing, isn’t it? What better than having the back hand of nature while asking such a difficult question? She’d definitely say Yes for sure! 5. The high on love- Proposal from the sea plane! Awwww! How amazing would it be to think you’re just taking a simple sea plane ride and when you look down you see this! Lucky girl! 6. The rock climbing duo in a fairytale proposal! The girl had no idea what she was going to see on a regular day climbing practice! Not so regular anymore, eh? Oh I’m gonna cry already! This simple yet pretty proposal by the beach simply stole my heart sway! A beautiful scene of sunset, with a simple yet utterly pretty decor, with bae on his knees with a ring! Can you imagine anything better than this? 8. Bigger than the beach ring proposal! 9. The ferry ride proposal with a soothing sea view! And that's what I call a surprise! Little did she know that a simple ferry ride would turn out to be the biggest moment of her life! So unexpected! 10. Beautiful proposal inside the hospital for the busy doc! This was the most amazing proposal that I came across - from an army officer to the pretty doctor! I can't imagine two people so perfect for each other! Ever imagined how to make an already amazing trip the best day of your life? Obviously with an adorable destination proposal in the mountains! 12. Disney Land proposal for the cute couple! 13. If you fall, let it be my arms-adventurous couple proposal! 14. The proposal that said ‘I love you’ out loud! If this doesn't mesmerize you, I don't know what will! On top of the world, with those amazing 3 words carved in the most mesmerising way! Love is in the air, literally! 16. The citylights proposal on a beautifully decorated terrace! 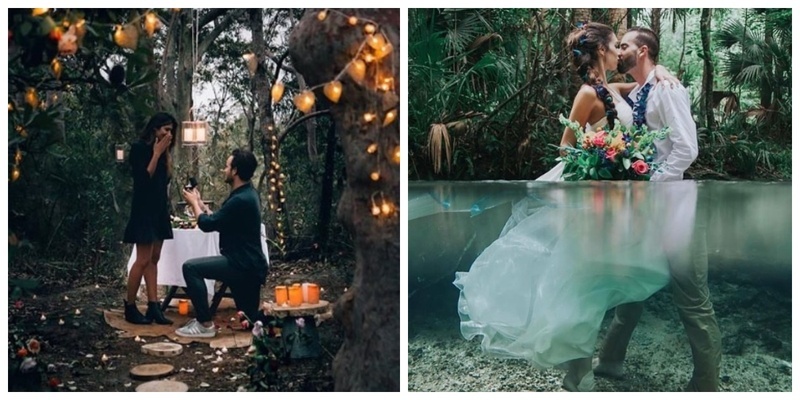 This lucky girl got asked the special question by bae in a fairytale setting! Lights and lights all around! 17. The beautiful decor proposal by the lake! Some proposals are captured so beautifully that if you are anything like me, you’d spend hours drooling over its picture! Yes, I’m talking about this gorgeous decor proposal for the lucky girl! 18. The most beautiful destination proposal in Greece! This cute couple had the most amazing destination proposal! I mean how amazing is that, being in a place so beautiful as this, and on top of it you celebrate the best day of your life, here in Greece! Simply Wow! 19. The poolside proposal decor! Though, we didn’t get to see the lucky girl experience the best day of her life in a setting so beautiful as this, but even so, we are still not able to get over this pretty proposal setting! 20. The boss babe proposal! This lucky guy got the sweetest proposal from the love of his life! Breaking all the stereotypes, this cute proposal was jaw-dropping beautiful! I’m not going to direct this to just guys (since the stereotypes have been long broken), so buckle up your shoes people to surprise your better half in the most amazing way!